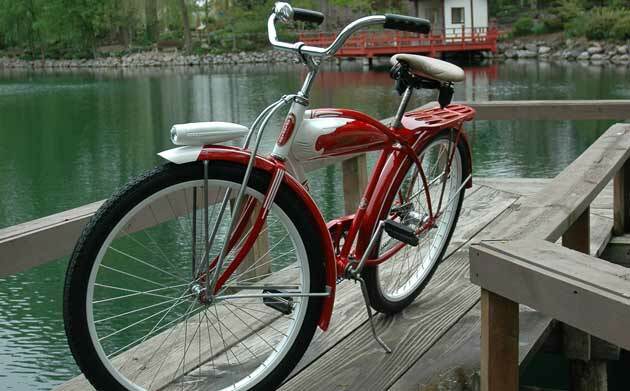 Sitting in a rummage sale, the old green Schwinn was nothing remarkable – except for the promise of how it could look when fully restored. Editor’s Note: The following article came to us from a writer living in Janesville, Wis. The collectors and restorers among us found it interesting and thought you would, too. The old bicycle came to me unexpectedly. I was out for a morning walk with my dog in June 2009, when I stopped at a rummage sale around the corner. I spotted the Schwinn near the garage, past a sea of furniture, household goods and knickknacks spread across the driveway. I’d been looking for a bike for a couple of years, and here one was, in my own backyard. A sign read, “$100 or best offer.” The man accepted my offer of $75. As I wrote out a check, he told me his brother had won the 1954 Spitfire in a coloring contest. It had seen happier days. The tires were flat. The disintegrated rubber straps that protect the inner tubes from the spoke tips hung limply from the rims. 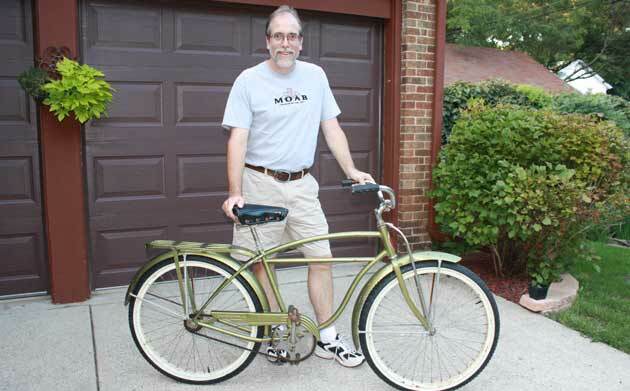 Originally, the bike had been a flashy red and white; now it was a dull olive green. “The seat isn’t original, either,” the seller told me, though I’d already guessed as much. “No problem,” I said, and eagerly wheeled it home. I’ve enjoyed studying antique cars and trucks since my childhood, when Dad and I built die-cast models of Rolls Royces, Deusenbergs, Model A’s and Model T’s. Yet I’m neither mechanically inclined nor particularly handy. Even if I had the money to buy and restore an old car, I have no place to keep one. A bike restoration would serve as Plan B.
I showed my acquisition to my 26-year-old son when he stopped by. “Guess how much I paid for it?” I asked him. “If you spent more than $2, you paid too much,” he replied. Wait and see, I thought. My plan was simple. I wanted to restore the bike as closely as I could to its original condition. I took it to a Janesville shop, Michael’s Cycles, for new rim straps and inner tubes. Next, I called Tom Skinner, a Janesville collector I became aware of when The Gazette, the newspaper I worked for, did a story about him. He fixes and rebuilds bikes, but he keeps the paint jobs original, in all their chipped and rusted glory. That, I learned, is what collectors covet. This was to be the first of two new friendships I developed because of my project. Tom was impressed that, instead of restoring my bike for possible resale and profit, I wanted to refurbish it simply to enjoy and ride it. He also thought the price I had paid was reasonable, but suggested adding a tank to make the bike look sharp. A tank would have been an option on my bike, though we couldn’t find any Spitfire illustrations that showed what it looked like originally. Tom helped me to install and grease new ball bearings in the front axle. He took me to a bike show in West Bend, Wis., but we failed to find a tank to fit my bike, which has a straight lower bar running from the seat post to the handle bar post. With the help of a Green Bay collector, however, we did find the right seat, a rusty relic with its cover half torn off. The vendor wanted $15 but accepted $10. He had recently purchased a Spitfire and showed me a picture of it on his cell phone. He pointed out that my bike originally had a fireball paint pattern, so I photographed a Schwinn at the show that featured that design. To refurbish the seat, Tom directed me to a local farmer who does sandblasting. The guy also agreed to prime the many parts so they wouldn’t start rusting. I applied a black finish coat, and Tom steered me toward an auto upholstery shop in nearby Edgerton, Wis., that put a new cover on the seat. The newly restored bike, with new, white-painted tires; restored paint job; new tank; vintage bike seat; and a new headlight. My search for a tank wouldn’t be as easy. Tom figured he could find one at a Chicago show, but he struck out. He urged me to contact Memory Lane Classics Bike Collector’s Bike Shop, of Grand Rapids, Ohio, where I had already ordered new tires, decals and stencils for painting the fireball pattern. The company was having an Asian manufacturer do “repro” tanks, or reproduction models. Months passed before they were available, and I ordered one that cost $160, including shipping. Inside was a battery-operated, push-button horn. With the parts assembled, the paint process was drawing nearer. That’s when I mentioned my project to a co-worker, who knew a fellow in his neighborhood, Mark Walhovd, who had painted a bike for my co-worker’s son. I went to see it and found it remarkable. Mark has made a cottage industry out of painting bikes, doing business as Wahoo Bikes. He was excited about painting my Schwinn and even more excited when he saw it. It would be the bike he had never painted. He figured he would need about $130 for supplies and another $100 for labor. He had no idea, however, how much time he would need to do the job meticulously. Mark immediately impressed me with his knowledge. I told him I had been unable to find photos of Spitfires. Within days, he emailed me numerous images, including a batch that showed one beautifully restored in blue and white. For the restoration, I wanted to be as hands-on as possible. So one Saturday in September, I went to work removing the green paint, applying Back to Nature Multi-Strip. The job was messy, but the product was “environmentally friendly” and did the trick. Red and white paint, hidden for decades, re-emerged. I couldn’t figure out how to disassemble everything, so Mark helped me. I kept the bare-metal parts, along with the fenders, which have white metal braces that attach to the wheel hubs, and left the painted parts with Mark. I called Memory Lane and was told that if the fender didn’t have holes in it, then it hadn’t come with a light. Later, I wandered into my basement workshop and picked up the front fender. Looking closely, I discovered that, before painting it green, the original owner had filled in the holes where a headlight once sat. I redialed Memory Lane and spent $60, including shipping, for a headlight. Mark and I became friends, too, during our weeks of collaboration, and he kept me updated on his progress. Meanwhile, I had more than 100 nuts, bolts, washers and other parts spread around my workshop. Some I taped to a piece of paper, jotting notes about where they belonged. After Mark finished sandblasting and priming, Tom helped me to borrow a bike with the fireball pattern from another local collector, so Mark could position the designs as precisely as possible. Mark placed the rusty, borrowed hulk in his living room for a guide as he worked. He noticed immediately that he had painted the wheel stripes too wide on my bike. He didn’t hesitate to suggest redoing them. When I finally saw the finished parts, complete with a clear finish, spread around his living room, I thought they were stunning. After the holidays, Mark and I carefully started reassembly in his garage. He used a grip stand to hold the main frame as we slowly and meticulously slipped parts back together without marring his beautiful paint job. Steel wool had done nothing to enhance the corroded originals, so I opted to buy new spokes. I again turned to Michael’s Cycles. The spokes were $1 apiece; adding $40 to install them, the cost was pushing $150. Equipment problems, then a blizzard, delayed the shop’s efforts. I was hoping to get the bike home by Super Bowl Sunday, when we planned to have a party for the game. I finally got the wheels from Michael’s that Friday, and took a long lunch break as Mark and I finished assembly. We shot pictures, and the lone question remaining was how much to pay him. Mark had assured me all along that he wasn’t doing this for the money. He spent more than 50 hours in all. I’d already paid $105 – below Mark’s estimates – for supplies. I gave him another $200 and said I realized it wasn’t enough. He was satisfied, however, because he sensed this project would help him get a foothold in the classic bike market. I assured Mark that I was delighted with his work. I was happy that I had a “before” photo of how the bicycle looked when I bought it at that rummage sale. Without that picture, no one seeing the bike today would understand how far it has come. My wife, Cheryl, and I had some of our Packer fan friends over to watch Green Bay play Pittsburgh in Super Bowl XLV. As we snacked and watched pregame shows, I brought out that first photo and reminded our guests of the project they had been hearing about for more than a year. Then I rolled the restored bike into the living room. It earned cheers from my friends. $26.38 New tire tubes, rim straps, check of hubs, installation; Michael’s Cycles, Janesville, Wis.
$25 Sandblasting and primer for seat; Norman McWilliams, Janesville, Wis.
$31.65 Seat cover and installation; Jim’s Auto, Edgerton, Wis. This entry was posted on Friday, October 14th, 2011 at 11:58 am	and is filed under Recreation & Destinations. You can follow any responses to this entry through the RSS 2.0 feed. Both comments and pings are currently closed. I have 3 1950s bikes I would like to restore. Two mens and one ladies two of them have baby seats they all are red and white. I live in Wichita Falls Texas 940 733 7428 is my cell. I need to know who I could contact about them.